The Cairo Genizah is an accumulation of 1,000 years of Jewish culture in the lands of Islam. From the time of its discovery in the Ben Ezra Synagogue in Fustat, Old Cairo (or rediscovery, since the storeroom from which it was finally removed in the late nineteenth century had been peered into by intrepid scholars, treasure-hunters, and tourists over several centuries), the collection’s sheer size has been guessed, estimated, and then, finally, counted in the early years of the twenty-first century. The Taylor-Schechter Cairo Genizah Collection in Cambridge University Library, the largest single grouping of Genizah Collection documents by an order of magnitude, boasts an inventory in the form of an Excel spreadsheet (enumerating only the class marks of the manuscripts) that itself is a whopping 32 megabytes big. A total of 137,000 class marks delineate 193,000 Genizah fragments: in some cases these fragments are tiny scraps, with only a few Hebrew or Arabic letters still visible, but “fragment” also describes broadsheet-sized marriage deeds of once luxuriously white parchment or carpet-sized sections of liturgically correct Torah scroll, tanned to a deep, rich brown. In size and significance, the Collection dwarfs its nearest rival, the Dead Sea Scrolls, and in its extent and diversity only that other great Egyptian collection, the Oxyrhynchus papyri, comes close. 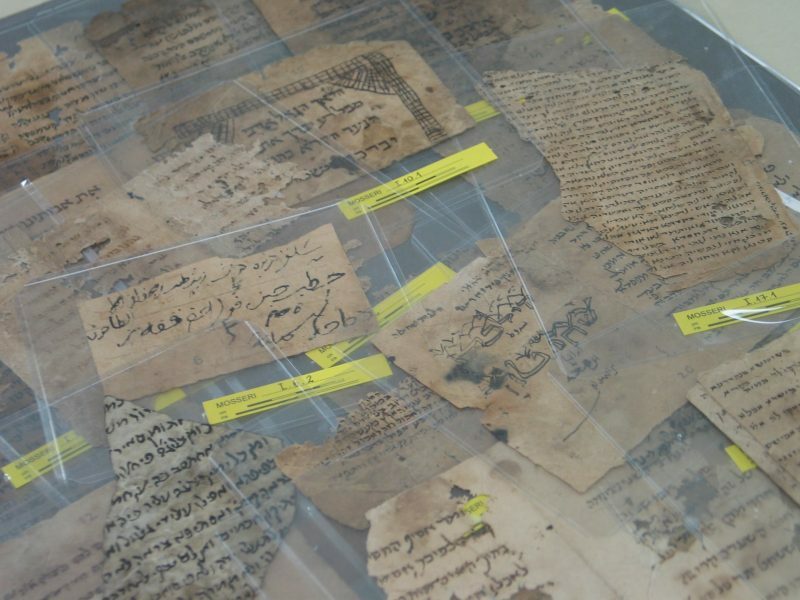 Fragments from the Cairo Genizah. The Genizah, to explore which was the object of my late travels in the east, is an old Jewish institution. The word is derived from the old Hebrew verb “ganaz,” and signifies treasure-house or hiding-place. When applied to books it means much the same thing as burial means in the case of men. When the spirit is gone, we put the corpse out of sight to protect it from abuse. In like manner, when the writing is worn out, we hide the book to preserve it from profanation. The contents of the book go up to heaven like the soul (Schechter 1897). Schechter at work in Cambridge. Schechter’s name, alongside that of the money-man, Taylor, is forever attached to the collection in Cambridge. Generously donating it to the University Library, he found a higher calling and a more prestigious role at New York’s Jewish Theological Seminary. Before his death in 1915 he had made a number of impressive discoveries in the Genizah, but he recognized himself that he had barely scratched the surface. 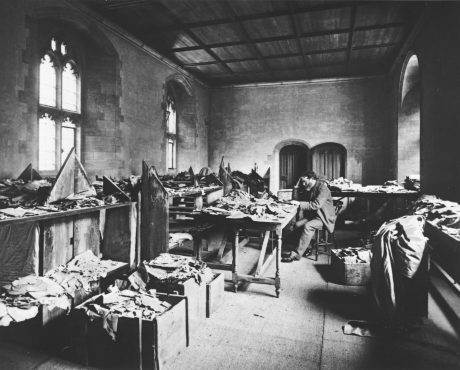 Schechter fished for texts that interested him: the monumental task of retrieving the collection done; he could afford an academic dilettantism thereafter. He understood that it was a collection of a scale and scope beyond one scholar, a combination, as he put it, “of sacred lumber-room and secular record office” that would prove “interesting alike to the theologian and the historian” (Schechter 1897). But at a stroke, the world of Jewish studies was changed forever. 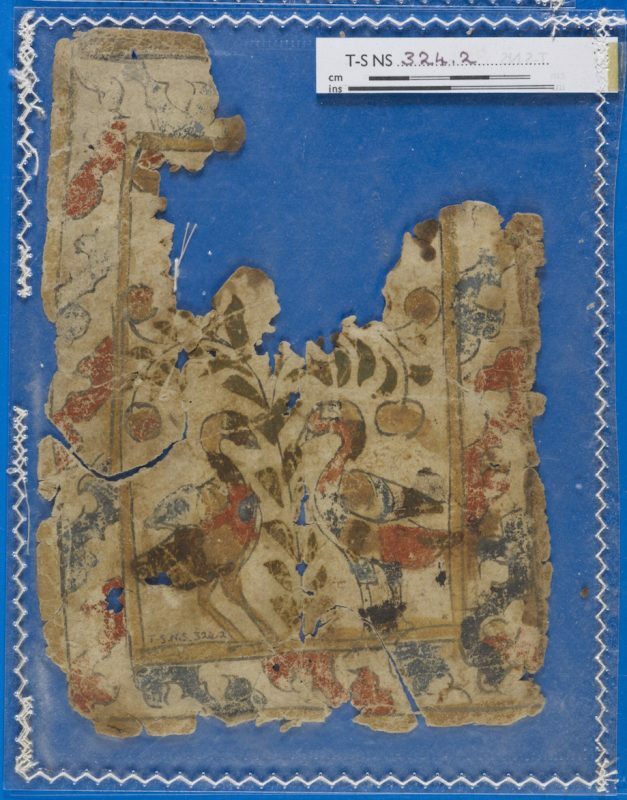 The Genizah has an archaeological character. Material seems to have been deposited as a result of different processes, or by the application of different criteria, throughout the history of the Jewish community of Fustat, piling up in stratified layers. Dig deep, and at the root of it all is the rabbinic prohibition against defiling the name of God: a religious text cannot be aimlessly discarded, but must be carefully stowed away. And so, at the base of the collection, we find there tens of thousands of leaves from the Hebrew Bible, with its countless repetitions of the Tetragrammaton: the sacred, ineffable Yod-He-Waw-He that spells the name of God. To these are added vast numbers of pages from prayer books, which attest to medieval Judaism’s wide and varied designations for the deity and his different facets: “the Place,” “the Rock,” “He who Spoke.” The earliest stratum of the Genizah, material written before the tenth century (as far back as the fifth or sixth century if we count the underwriting of palimpsests), is just as we might expect: Bibles, prayers, and other theological works of a traditional type. Babylonian Gaon Nehemiah ha-Kohen’s ca. 960 CE epistle from the Academy of Pumbeditha in Iraq. Today, however, the Genizah Collection is as famous for its documentary material—Schechter’s “secular record office”—as for its Bibles and liturgies. 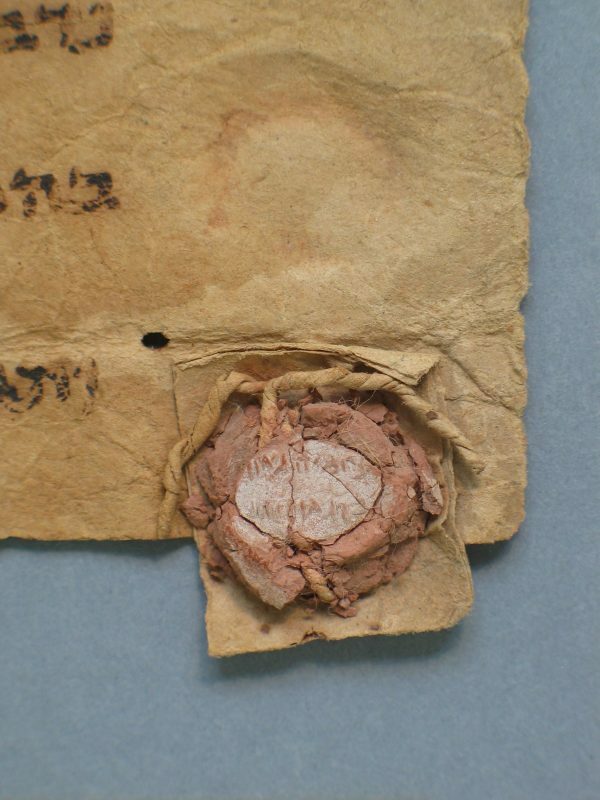 The earliest documents probably owe their survival not to deliberate consignment into the Genizah, but to being caught up among other papers—perhaps those of a deceased Jewish community leader—and deposited, unsorted, into the Genizah chamber. The Babylonian Gaon Nehemiah ha-Kohen’s ca. 960 CE epistle from the Academy of Pumbeditha in Iraq, a big fancy letter on expensive paper with—uniquely—a geonic bulla still attached, is probably one such example. But by the beginning of the eleventh century, the deposit of documentary archives appears to have become commonplace, as letters, legal documents and accounting records all pile up in the thousands. Whether it is from the common use of divine names in the correspondence or the perceived sacred character of the Hebrew script itself (lešon ha-qodeš, or “the Holy Language”), is unclear, but nonetheless the Fustat community clearly felt a great need to preserve their written legacy. The historian Alexander Marx stated matter-of-factly, and a little underwhelmingly, in his postwar summation quite how important this documentary archive was: “The period from the tenth century to the twelfth century, which was among those shrouded in darkness in Jewish history, has become known to us in considerable detail” (Marx 1946/47:186). The Genizah research of early scholars such as Cowley, Lewin, Assaf, Chapira, and Jacob Mann painted our first pictures of the political history of the Jews under Islam. Mann dipped into the boxes of manuscripts in Cambridge University Library and revived the little-known Jerusalem Academy, gave us its rites, its tradition of reading the Pentateuch in a three-year cycle, and examined the tussles between the Palestinian and Babylonian Jewish communities in Fustat. But his work is by its nature patchy, as he dug down into a vast, uncataloged, and little-understood collection. Though he made attempts at a narrative history, the reader can clearly discern that Mann is forced to segue from one episode to another in a succession of vignettes, snatches of Jewish history frozen in time. As Hebrew, which Mann knew well, gave way to Judaeo-Arabic in the letters and deeds that he relied on, Mann’s picture of Jewish history becomes correspondingly more attenuated. The Fustat hoard found its chronicler in the 1950s with S. D. Goitein. Goitein’s interest in the social and economic history of the eleventh to thirteenth centuries put flesh on the skeleton assembled by Mann and others, and culminated in a masterpiece, his five volumes (plus a sixth index volume) of A Mediterranean Society, a work that has defined the size and shape of the documentary archive for a whole generation of subsequent scholars. Goitein, an Arabist, linguist, and anthropologist by training, transformed himself—or was he shaped by the Genizah?—over a whole series of monographs and hundreds of articles as he threw himself into the world of the Genizah. Delighting initially in the economic texts, which threw light, for instance, on the price of bread and the routes of the wheat trade over the course of hundreds of years, Goitein left no detail of Mediterranean commerce unmentioned in Volume One of A Mediterranean Society. Subtitled “Economic Foundations,” it has a whole chapter on packing and packaging, down to descriptions of the type of wickerwork baskets used to carry sal ammoniac. It is this touch of an expanded existence which makes reading the majority of the Genizah correspondence so pleasant. It was a civilized world, of people who knew how to behave, who were considerate, paying proper attention to their fellowmen. He knew his station in society but was not unduly deferential to his superiors. To be sure, the very cadence of Arabic speech sounds hyperbolic to our ears. But, in general, as befitting busy people, their statements were concise, clear, and to the point – somehow reflecting the clarity of the Mediterranean sky (Goitein 1967–1993:7). Unlike Solomon Schechter, who was able to walk away—indeed give away the Genizah—and start an altogether different career in America, Goitein immersed himself, like a romantic orientalist, into the world which he studied. Mann, never quite coming to grips with the sources, remained apart, detached, as if looking in from a distance, an astronomer with an imperfect telescope, seeking to make sense of only partial information. Goitein, however, metaphorically donned native garb and haunted the souks and alleyways of medieval Fustat, leaving nothing unread or unreported and relying on his imagination to fill the gaps. No one has better interpreted the everyday texts of that lost world, or squeezed so much life out of discarded ephemera. But no other collection has had such a seductive effect. The unique combination of its immense size but remarkable, detailed intimacy gives the Cairo Genizah an exhilarating, neverending attraction, to the point of scholarly addiction. Solomon Schechter, in his first description of the discovery in the Times (1897), states “The number of fragments procured by me equates, I think, to about 40,000.” By any manner of counting he was way off. The inventory, carried out by the staff of the Genizah Research Unit in Cambridge, was the brainchild of Professor Yaacov Choueka of the Friedberg Genizah Project, who recognized that to digitize the entire collection, we should first and finally know its full extent. The tale is beautifully told in Hoffman and Cole (2011) but there is much of interest in S. C. Reif (2000) and M. Glickman (2010). Cambridge University Library Jacques Mosseri Genizah Collection, Mosseri VIII.479. The Mosseri Collection is another Cairo Genizah Collection in Cambridge with an interesting and, ultimately, ironic history. See Outhwaite (2009). Hebrew was still the preferred language of most official Jewish correspondence in the early eleventh century, but it was superseded by Judaeo-Arabic following the decline of Jewish life in Palestine in the second half of the century. Mann didn’t read Arabic, and his two volumes of The Jews in Egypt and in Palestine under the Fāṭimid caliphs; a contribution to their political and communal history based chiefly on genizah material hitherto unpublished (2 vols; London etc, 1920–22) contain almost no Judaeo-Arabic sources. For the history of documentary Hebrew in this period, see Outhwaite (2013). Glickman, M. 2010. Sacred Treasure—The Cairo Genizah: The Amazing Discoveries of Forgotten Jewish History in an Egyptian Synagogue Attic. Woodstock, VT: Jewish Lights. 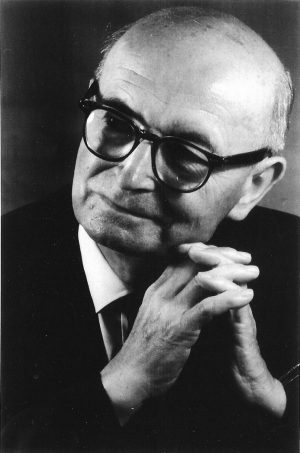 Goitein, S. D. 1967–1993. A Mediterranean Society: The Jewish Communities of the Arab World as Portrayed in the Documents of the Cairo Genizah. 5 vols. with an index volume by P. Sanders. Berkeley, CA: University of California Press. Hoffman, A., and Cole, P. 2011. 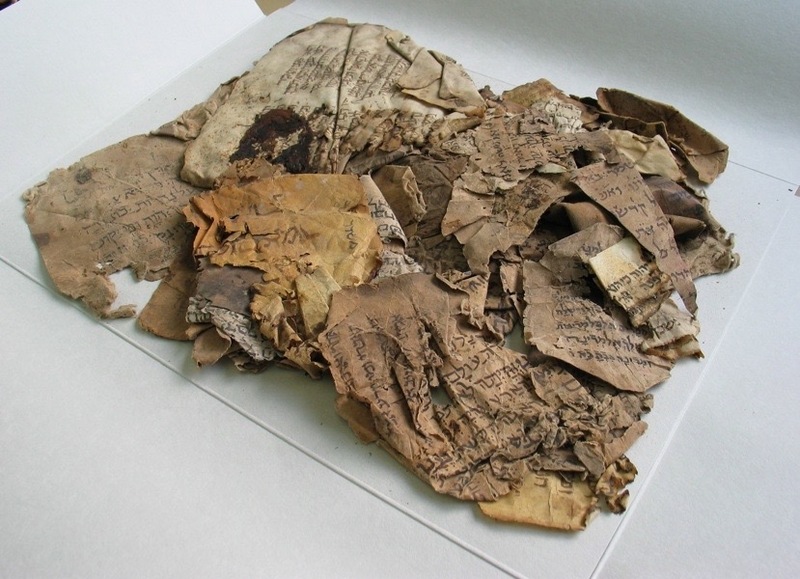 Sacred Trash: The Lost and Found World of the Cairo Geniza. New York: Schocken. Marx, Alexander. 1946/47. “The Importance of the Geniza for Jewish History.” Proceedings of the American Academy for Jewish Research 16:183–204. Outhwaite, B. 2009. “Taylor, Schechter and Jacques Mosseri.” In Charles Taylor and the Genizah Collection, edited by Stefan Reif (pp. 75–80). Cambridge, UK: St John’s College. ———. 2013. “Lines of Communication: Medieval Hebrew Letters of the 11th Century.” In Scribes as Agents of Language Change, edited by E-M. Wagner, B. Outhwaite and B. Beinhoff (pp. 183–198). Berlin, Germany: Walter de Gruyter Inc.
Reif, S. C. 2000. 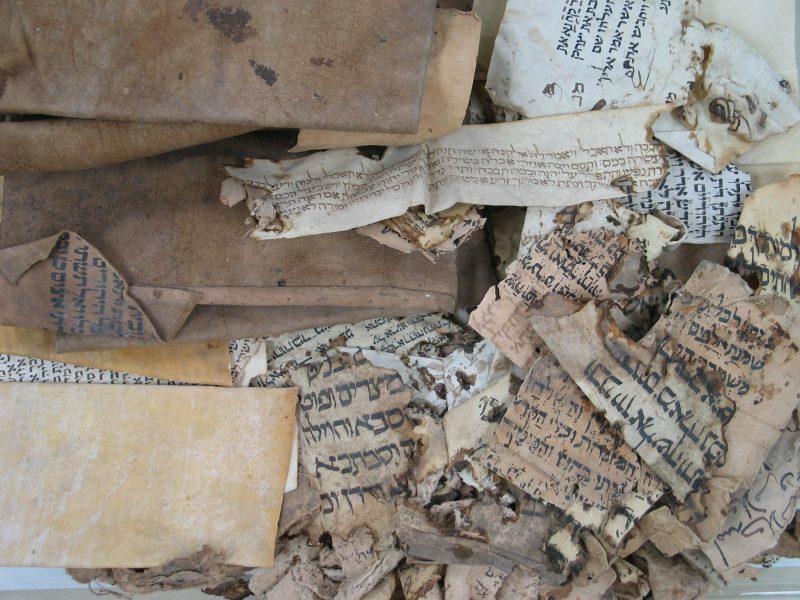 A Jewish Archive from Old Cairo: The History of Cambridge University’s Genizah Collection. Richmond, UK: Routledge. Schechter, Solomon. 1897. “A Hoard of Hebrew MSS.” The Times, August 3.